On occasion, I will get questions about how we travel agents (TAs) make money, and how we get paid for our services. If you've not worked with a TA before, you might wonder how we earn our living. Well it's your lucky day because I am here to share that top-secret information with you! 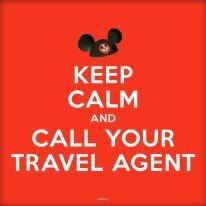 * We don't get paid unless we're your travel agent. We're happy to do no-obligation quotes and answer questions if you're considering a vacation, but if a trip is not booked by us, we don't get paid. One common misconception is that our agencies and/or the suppliers (such as Disney) employ us and pay a salary. There might be some agencies out there who do (such as brick-and-mortar travel offices that might pay a salary instead of commission) but in general, the vast majority of travel agents are commission only. We also get paid after your trip is over, so we might work with you for months or even a year, and we're paid after your vacation is done. Think of travel agents as you would your realtor. If you decide to sell your home, they'll spend time with you taking pictures, listing the house, getting it ready to sell, running open houses, etc - but he/she doesn't get paid unless they sell your home. We're always happy to do quotes for you, truly; but if you get quotes and then book the vacation yourself, we won't get commission for that vacation. Deciding not to work with a TA is absolutely fine, but please keep this in mind if you're asking for multiple quotes, special information, etc. * We are not able to give advice, help you plan, take care of your vacation without you booking the vacation through us as your travel agent. Often, I've quoted travel options and I've not ended up booking the vacation. Which happens, and is no big deal. Sometimes plans change, or people can't take a vacation right now, etc. I never mind doing quotes for people, even if a trip doesn't work out for them right now. However, on a rare occasion I've also heard back from people who didn't using me as their TA or pay an ala-carte planning fee but still wanted me to give advice about their vacation and help them plan. This is something that I am not able to do. What most people don't realize (I didn't know this before I became a TA) is that in addition to it not being a great business decision to answer questions for non-clients, it's also a liability issue. Many agencies carry Errors and Omissions Insurance but the insurance only covers clients who we've booked. If, God forbid, there's a big enough problem that a possible E and O claim would need to be filed, that could hurt the travel agent personally and result in a judgement against them, vs being filed with the agency's E and O insurance. *I LOVE what I do, and I have fun doing it - but this is still a job. As I've said 1,000 times here on this blog - I LOVE Disney. Obsessed. I am on some sort of Disney vacation (parks or cruise) at least 3 times a year. But - I still have bills that need to be paid. If I could pay my mortgage and keep the lights on via a money tree in my backyard, perhaps that would be a different story. But until that money tree sprouts, I need to have income from my job. Think about a friend or relative who's an accountant. You might ask one or two quick questions but you wouldn't ask them to prepare your taxes for you each year, for free. Their time is valuable and they need to be compensated for doing your taxes. Hopefully this was helpful information and gave you some insight on how travel agents work and are compensated.